Pilocarpine causes constriction of the pupils (miosis) and reduces pressure within the eye. 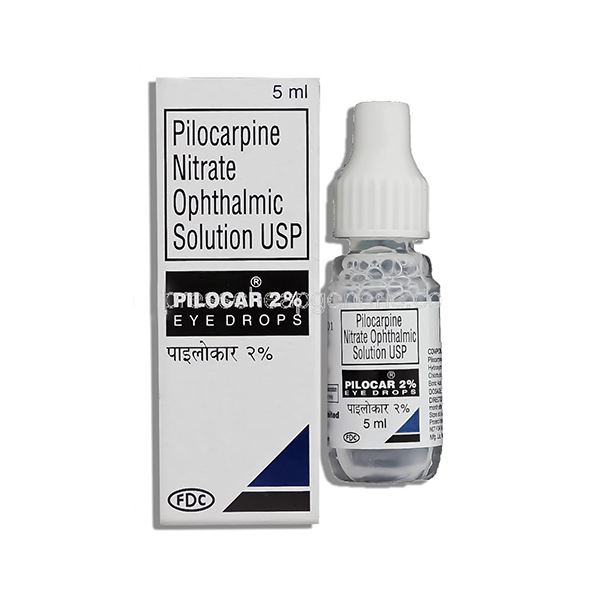 Pilocarpine causes constriction of the pupils (miosis) and reduces pressure within the eye. It is used to treat the increased pressure of open-angle glaucoma and to lower eye pressure before surgery for acute angle-closure glaucoma. It can be used alone or in combination with other medications. Use Pilocarpine as directed by your doctor. Gently pull your lower eyelid down to form a pocket next to your eye. Brace the eyedrop bottle on the bridge of your nose or your forehead. Tilt your head back and squeeze the medication into your eye. Close your eyes gently. Keep them closed for 1 to 2 minutes. Do not rinse the dropper. Wait for 5 to 10 minutes before using a second eye medication. The usual starting dose is 1 or 2 drops up to 6 times a day, depending on the severity of the glaucoma and your response. During a severe attack, your doctor will tell you to put drops into the unaffected eye as well. Ask your health care provider any questions you may have about how to use Pilocarpine. Pilocarpine acts on a subtype of muscarinic receptor (M3) found on the iris sphincter muscle, causing the muscle to contract and produce miosis. This opens the trabecular meshwork through increased tension on the scleral spur. This action facilitates the rate that aqueous humor leaves the eye to decrease intraocular pressure. Apply it as soon as you remember. If it is almost time for your next dose, skip the one you missed and go back to your regular schedule. Do not take 2 doses at once. Store Pilocarpine between 68 and 77 degrees F (20 and 25 degrees C). Brief storage at temperatures between 59 and 86 degrees F (15 and 30 degrees C) is permitted. Store away from heat, moisture, and light. Do not store in the bathroom. Keep Pilocarpine out of the reach of children and away from pets. you are allergic to any ingredient in Pilocarpine.